Soups always offers us nutrition, calories and helps to kill your appetite when dieting. Vegetable clear soups are often a base for other complex soups, stews and sauce. 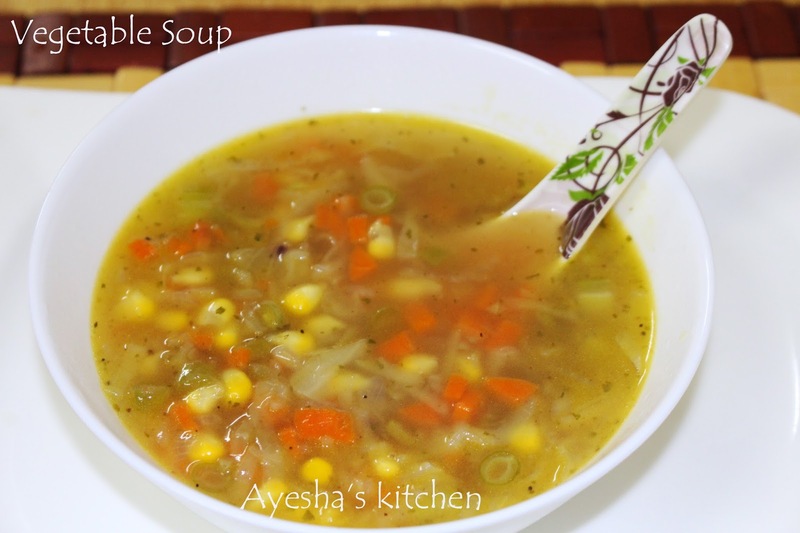 As vegetable soup recipe is very quick and easy to make, we all love to have this more often at home. 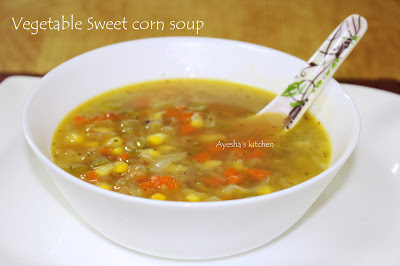 Here am sharing a comforting, filling vegetable sweet corn soup recipe .Vegetable sweet corn soup is a very flavorful soup recipe prepared with vegetables and sweet corn. Its very healthy, simple and is enjoyed by all age groups equally. Do try and enjoy each sip of your delicious soup. Here is the recipe showing how to make vegetable sweet corn soup / easy soup recipes /healthy soup recipes / homemade soup. Add healthy soups in your diet. Heat oil/ butter in a vessel and toss carrot chopped, cabbage chopped, spring onion and french beans chopped for 2 minutes. Then add 4 cups of warm water to it along with cream corn, boiled corn kernels, mix well and bring to boil on a medium flame. Let it cook for 5 minutes in a medium flame. Add sugar, salt to this simmering soup and cook for other 3 minutes. Now mix in the cornflour mixture and stir well until the soup thickens slightly. Add the pepper powder and turn off the flame. Garnish with some spring onion and serve hot.